Katie Wood is our Office Assistant and Payroll Clerk. 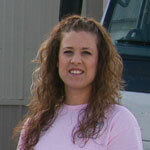 Katie (Burt) grew up in the business, helping with drain cleaning and various other responsibilities. She joined us in the office in 2006 and has really been great help. She is working on a Business Degree online with Eastern Oregon University. Katie graduated from Fruitland High School and went to work at Walmart where she met and married Chad in 2003. Chad and Katie live in Fruitland with their four children, Savanna, Cameron, Addyson, and Kelly.